The Tagua Gunleather Holster for the Ruger LC9 with Crimson Trace Laser is a well made paddle-style holster. The materials are top-notch. The fit and finish are excellent. Out of the box, the fit to the pistol is quite good, and the quality leather tends to lead me to believe that it would only improve with time. Unfortunately, the holster is useless. See the picture below. I trust you can read that red text. No, you can't get a finger into that tiny gap between the pistol grip and the leather. If they had angled the leather down a bit, or swapped the stitched area to the front (visually odd looking, but it could be done), it would be a different holster. 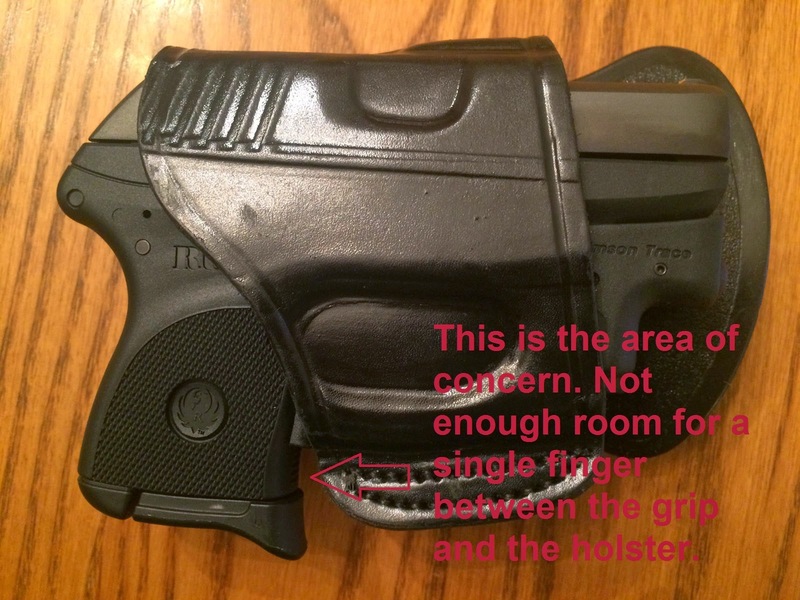 As is, in order to retrieve the gun from the holster, you have to get it in a pinch between the thumb and index finger, up at the web, and then wiggle it up. Once up far enough, but not so far as to fall out of the holster, then you can shift to a proper grip and complete your draw stroke. I found that awkward as hell standing in my house on a Sunday afternoon. I can't begin to imagine how it would feel in the middle of a critical incident. Somehow, I don't think it would engender a lot of confidence in any concealed carrier.. I'm going to rate this model and only this model as a Do Not Buy. However, as soon as I figure out which pistols I have that need a holster (hm-m-m, I think that Luger may need one) I'll try another one and see how it works with a larger pistol. I'm betting that with a larger gun the problem will disappear.